Renderings of Pegasus helped illustrate the theme of MANE’s Course for Hope 2019, which was to “Inspire New Heights”! 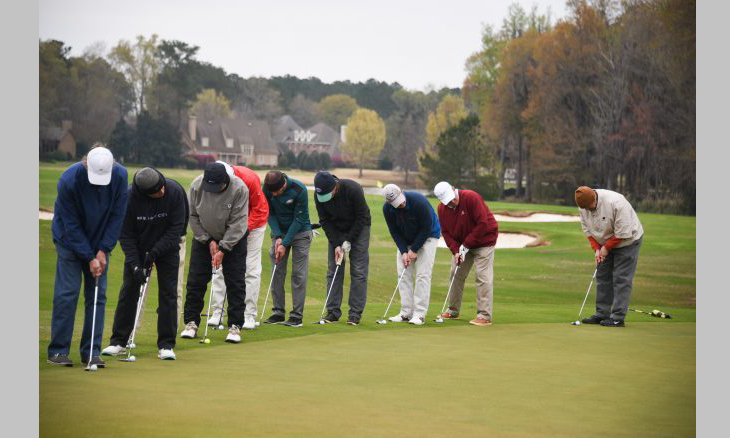 Course for Hope is an event held every other year at Wynlakes Golf and Country Club to help provide funding for the equine-assisted activities program for River Region children and adults (including veterans) who have physical, cognitive, developmental, and emotional disabilities. Regions Bank was the lead sponsor for the entire roster of events which took place on Monday, March 4th beginning at 11:30am. Each golf hole sported a white flag with Regions’ green logo. Twenty-six golf foursomes competed for Apple Watches, Apple 4K TV’s and Lenovo Smart Displays and other prizes over the course of 18 holes. The Course for Hope Golf Tournament par 3 hole-in-one prizes included a Two Riverside Chevrolet Silverado’s, and a Tag Heuer watch courtesy of Ware Jewelers. Sharon Mills who played on ASE Credit Union team, won the putting contest, just before the golfers headed out to the tees for the shot gun start! 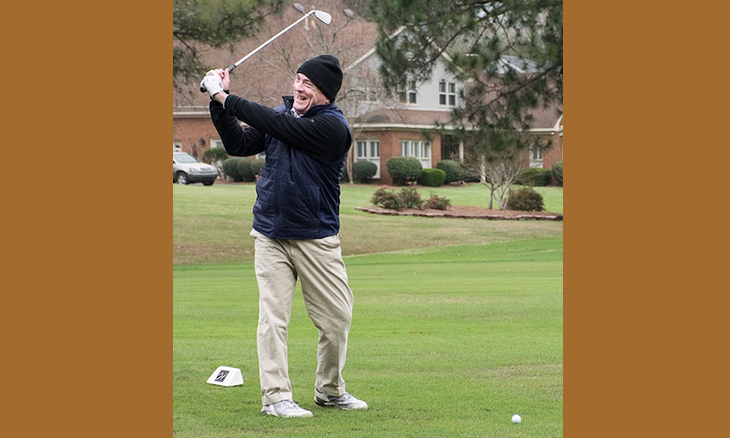 Mark Snead, the President and CEO of Synovus in Montgomery, welcomed golfers to the lunch sponsored by Synovus. Lunch was served as a delicious buffet dressed in red, white, and black. 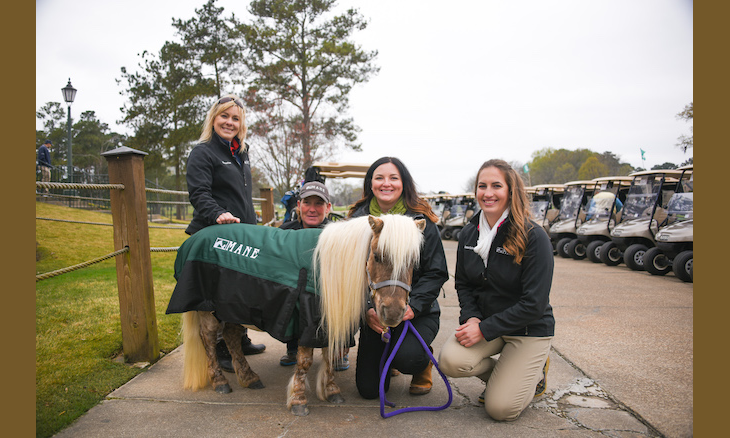 Whinnie, MANE’s miniature horse, braved the chilly weather to wish each competitor the best of luck as they headed for the golf course. The driving ranges, putting green and the 18 golf hole were sponsored by Adams Drugs; AES Industries; Ainsworth Game Technology, Alabama Power Company; Aprio, LLP; Aronov Realty Management, Inc.; Balch & Bingham, LLP; Baptist Health; Beasley Allen; Brasfield & Gorrie; CMH Architects; Dixie Electric, Plumbing, & Air; Evans Meats and Seafood; Goodwyn, Mills, and Cawood; HOAR Construction; Neptune Technology Group; Power South; Ready Mix USA; Stewart Perry Construction; Sysco Central Alabama; and The W A Williamson Family Foundation. Wynlakes Head Golf Pro Steve Cutler was the master of ceremonies for the golf portion of the day. All golfers were checked-in and given participation prizes, including Regions/MANE golf hats; white and gray golf shirts, and FootJoy golf shoes by volunteer Joan Forst and her friends Elaine Boese, Annette Simmons, and Sue Sistrunk. Tournament hole-in-one witnesses were Joan Forst, Elaine and Larry Boese, Belinda Arnott, Susan Kim, Jane and John Shannahan Marty Greenwood, Elizabeth Mahan, Bobbie McAdams, and Linda Pate. “Closest to the Pin” winners on the 4 par 3 holes were given a chance to win one million dollars. Todd Vickers (AES Industries), Lee Barton (Graham Esdale’s Team), Reginald Hawkins (Synovus #1), Buster Russell (Merrill Lynch PBIG) tried to get the ball in the hole from 165 yards away from the 18th pin to claim the cash. A brisk wind yielded a very challenging playing environment, with three of four contestants hitting the green but not sinking the ball. Despite chilly temperatures and drizzling rain, participants gave a good ole college try and had a successful day of golfing! Tournament Champions were team Bobby Kemp, John Bricken, Max Vaughn, and Rick Wendling (Goodwyn, Mills, and Cawood) who won Lenovo Smart Displays. Runners-up were team Eric Schroeder, John Archuleta, Alan Reeves, Mel Adair (Ainsworth) who won Apple Watches. Third place winners were team Greg Newton, Gary Headley, Steve Livingston, and Jason Baker (Dixie Electric) won Apple 4K TV’s. At 5:00pm guests of the golfers and other friends attending the evening festivities were greeted at the main Wynlakes entrance by MANE Board Members Lydia Beringer, and Jenny Brown as well as MANE Program Director Tiffany Atkinson, Assistant Program Director Abby Houchin, Volunteer Coordinator Jess von Gal and MANE instructors Kim Alford and Brittany Queiroz. After the cocktail reception, participants were ushered through pearly doors and into to the “celestial” Ballroom for a divine steak dinner sponsored by Merrill Lynch Private Banking and Investment Group’s Laurie Russell of Montgomery. Ms. Russell is a Senior Vice President and Financial Advisor. Dinner tables and chairs were dressed in white linens. On the tables, “cumulus” clouds and twinkle lights surrounded bottles of red wine and white galvanized buckets filled with bottles of white wine, courtesy of United Johnson Brothers. Arthur DuCote of Regions Bank lead the evening prayer thanking God for the dinner, the event, the blessings bestowed on each participant, and for MANE. The menu included blue cheese and bacon wedge salad; an entrée of thick and delectable steak; grit souffle with chunked mushrooms red-wine sauce. The desert was, of course, layered angel food cake. As soon as the servers left the ballroom, Granger Thaggard Auctioneers took their places among the tables to be able to see each and every bidder. Jack Granger encouraged, coaxed, coddled and entertained the audience making sure that each of the auction items went for top dollar. Raffle tickets were purchased by attendees for a beautiful horse hair bag. Laurie Russell drew the winning raffle ticket for David Woods. Live auction items included the use of the Regions Suite at a Biscuits’ home game; luxurious golf and spa retreats at The Grand Hotel (Fairhope, AL), Ross Bridge (Birmingham, AL), and The Battle House (Mobile, AL); 100 level 50-yard line tickets to a Tennessee Titans home football game with rooms at The Thompson Hotel in Nashville; a week in a stunning NC mountain home; 7 nights in a villa on Santorini, Greece; 7 nights in a cottage in Killarney, Ireland including a guided tour of Dingle; a week in a villa in Manciano, Italy; a deep-sea fishing trip; an E-Z Go S4 Golf Cart; a week in a private home in the Bahamas; a speckled trout fishing trip in Venice, LA; and tickets to The Regions Tradition Senior PGA Golf Tournament with VIP tent access; and a spectacular oil painting by Becky Chrzanowski! The “Catch A Miracle” program garnered more than 192 rider scholarships, ensuring that more deserving families than ever before will have access to MANE’s services and resources. MANE Board Members helping with the event were Cindy Longshore, Lela Snead, Jenny Brown, Cheri Jordan, Heather King, Sandra Stenger, Katharine Harris, and Susie Wilson. MANE volunteers on hand included Carrie Cauthen, Colleen Buce, Kaylie Campbell, Kate Sherwood, Richard Keeshan, Colin Claybrook, and MANE intern Alexa Parker. MANE volunteer photographers for the event were Kay Keeshan, Liz Quinn, Bethany Campbell of Elegant Oaks Photography, and Preston Walker. The next MANE’s Course for Hope Golf Tournament Dinner and Auction is on March 1st, 2021! Visit MANE’s website www.maneweb.org for event updates and information about riding, volunteering and donating. 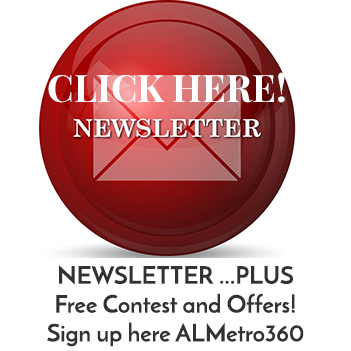 MANE is located at 3699 Wallahatchie Road, Pike Road, Alabama 36064. The MANE number is 334-213-0909. Please mark your calendars for MANE’s “Raise the Roof” party hosted by Wintzell’s Oyster House at MANE’s therapeutic riding facility on Thursday, October 24nd, 2019.